A young woman with terminal cancer made news the last couple weeks when we learned that that 29 year old Brittany Maynard had moved from California to Oregon so that she could take advantage of the state’s “Death with Dignity” law. This is a fascinating 21st Century cultural moment in America. We learned this weekend that she has indeed died. On that cover is a very alive looking woman photographed we’re told on October 11. Of course I have no idea where this will lead with what has been called assisted suicide (no longer allowed in polite discourse I’m afraid, too biased and negative), but this seems a bit like a watershed moment in the increasingly secularization of American society. Such decisions may not be all that controversial in the years to come. The reason for this can be found in the way this has been presented and publicized; you might be tempted to see this as a PR campaign for the forces of assisted suicide (old habits are hard to break). It hits all the right notes that appeal to a post-Christian, post-modern American culture with a growing percentage of “nones.” On the surface it has incredible appeal and a kind of logic 21st Century Americans find irresistible. I couldn’t help but thinking as I was reading articles about this of a movie I saw recently that was inspired by a book of the same name, The Giver. Life doesn’t always imitate art, but in this case it bears a scary resemblance. In a whitewashed world all death and pain and suffering are apparently conquered. Underneath the veneer of a happy go lucky people, however, we find out that death and pain and suffering are not so easily extinguished after all. Unfortunately, this movie is probably an outlier. Compassion and choice are much easier to market. There is never a hint that maybe life, even our own, is not ours to take (of course, if the material is all there is, I can do what I damn well please with my life). Or that maybe there might be some downside, some unintended consequences, to this idea that we can tidy up the blatant ugliness that is death. And make no mistake, death is ugly, as ugly as ugly gets. As I often, probably too often, tell my family, we are all slowly but surely rotting. Entropy takes no prisoners. No, there is no dignity in death. And death is a strange thing. 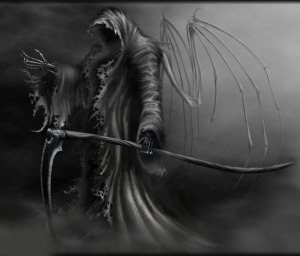 There is a portion of humanity that although they know the Grim Reaper is coming, relentlessly, never give a thought about what death might mean; they never ask the question, why is there this thing we call death after all? For them ignoring death or finding some way to sanitize it is very appealing. The other part of humanity, with very good reason in my estimation, refuses to let death be a brute fact, something that requires no explanation; its meaning must be addressed. If there is any meaning. As for assisted suicide, given the pace of social change in America, we may find in the not too distant future that the Hippocratic Oath, something all doctors until recently swore to, will become as passé as traditional marriage, you know, mom, dad, married, kids.